The Patient Storm is an exciting enigmatic conceptual art poem, influenced by Native American tradition from Dana Claxton. Dana Claxton (poet, filmmaker, photographer, performance artist, art juror, art curator, teacher), descended from the Hunkpapa Lakota Indian peoples, currently teaches at the University of British Columbia. She directed and produced Wakanhija, an Indigenous peoples themed children’s program, Art Zone, for young adults, First Stories – VTV about the Indian peoples of Vancouver. She won the Eiteljorg Fellowship for Native American Fine Art in 2007. The story of the poem is enigmatic, suggesting that something is not alright with the world, it is a story of magic and wisdom. In the personification of the events of the storm (Storm, Lightening, Thunder), an original story-telling element in the Western tradition of poetry, except perhaps in children’s stories, it is used here in a powerful way of great intrigue and magic, a play on New Age ecology themes and perhaps borrowing from Native Indian people’s culture and life ways. Amongst the Hunkpapa Lakota there is strong kinship and a strong bond with the land, the idea of sustainability and stewardship, “mitakuye oyasin” or “we are all related”, an idea of synchronicity. As if falling into a performance art work in poetry, this short dialogue lives inside the beauty of a truthtelling, a story of the North American present day in old world Native American symbolism. 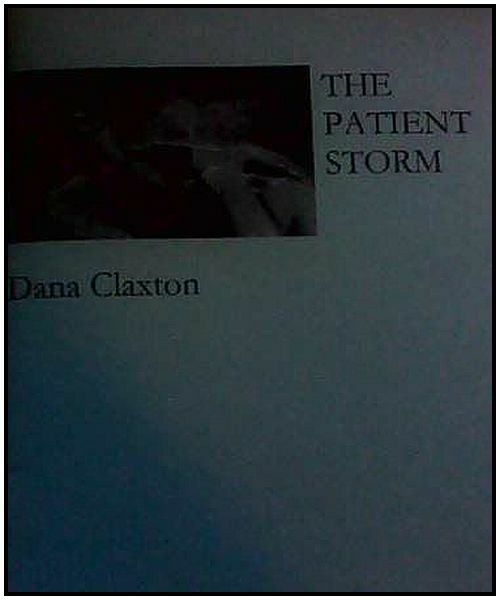 A new offering in The New Age Renaissance Republique of Poetry, The Patient Storm by Dana Claxton and above/ground press.